Madison, Wis. • Moments after 22-point underdog BYU celebrated the biggest upset to date in the young college football season and House of Pain’s hit song “Jump Around” was finally and symbolically silenced, head coach Kalani Sitake said the game ball would go to the Cougars’ strength and conditioning staff and nutritionists. Handing the No. 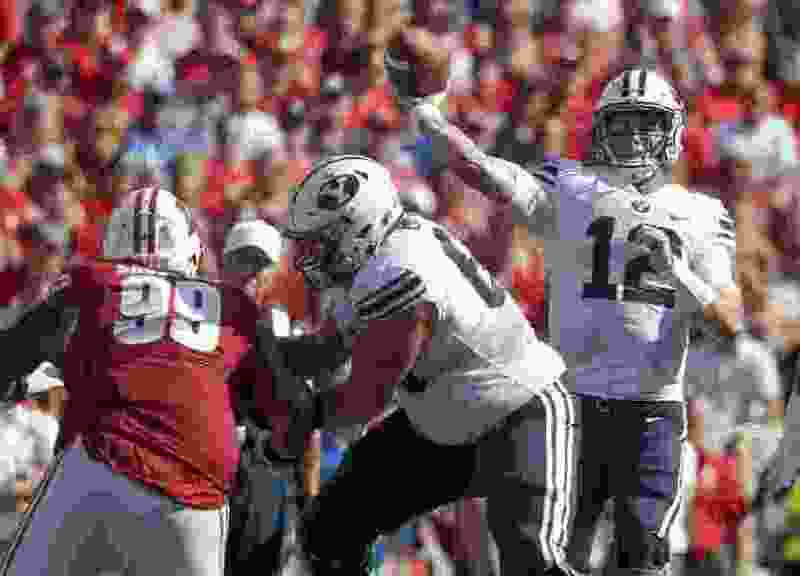 6-ranked Wisconsin Badgers a taste of their own medicine, and exacting revenge for an epic beatdown last year in Provo, the Cougars pulled off a 24-21 stunner in front of 80,720 disbelieving fans and a national television audience Saturday afternoon. “That was a great moment for our team,” BYU quarterback Tanner Mangum said. Heck, it was a defining moment for the program, which hadn’t won a game this big since it surprised No. 3 Oklahoma 14-13 way back in 2009, Max Hall’s senior year. The victory snapped Wisconsin’s 41-game home non-conference winning streak and a 20-game regular-season winning streak. Sitake, rebuilding a program that went 4-9 last year, declined to rank the win that perhaps signaled that his desire to return discipline and toughness to the program is on track. But he said the Cougars won the game in the trenches, outslugging UW at its own game. After last year, why wouldn’t he? The Cougars survived when Wisconsin kicker Rafael Gaglianone’s only field goal attempt of the game sailed wide left with less than a minute remaining. Sitake called two timeouts in what was thought to be an attempt to ice the kicker after the Badgers had driven from their 8-yard-line to the BYU 24 — they got a bit conservative, which helped BYU — to move into scoring position. However, he said he called the timeouts to give his defensive players — specifically 6-foot-9 kick-blocker Corbin Kaufusi, a rest. BYU took the 24-21 lead on Skyler Southam’s 45-yarder with 9:58 remaining after the freshman missed from 52 in the first half and Sitake told him he’d get another chance late in the game. A year after giving up nearly 500 yards to the Badgers and getting fewer than 200, BYU went toe-to-toe with the Big Ten power, finishing with 311 hard-earned yards. Wisconsin had 394. Senior Squally Canada busted off two big runs, for 44 and 46 yards, and finished with 118 yards and two touchdowns on just 11 carries. His 46-yarder came after Wisconsin drove 82 yards in 10 plays and tied the game on Taiwan Deal’s 5-yard TD run. Heisman Trophy candidate Jonathan Taylor was held to 117 yards and no touchdowns on 26 carries. Wisconsin had all the momentum, but Canada ended that with the big run. The Cougars used the jet sweep effectively in the first half — as they did against Arizona two weeks ago in a 28-23 win — and receiver Aleva Hifo emerged as a hero, but not for his receiving or running. Hifo gave BYU a 14-7 lead early in the second quarter on a trick play the Cougars installed Monday and called, fittingly, “Bucky” as a nod to UW’s mascot. Hifo took a backwards pass from Mangum, then lofted the ball to a wide-open Moroni Laulu-Pututau for a 31-yard touchdown. “I told Tanner I am coming for his job,” said Hifo, who added 45 yards on five carries and caught three passes for 32 yards. Although BYU mostly outplayed the Badgers in the first half, Wisconsin tied it 14-14 late in the half on Alec Ingold’s 2-yard run. But quarterback Alex Hornibrook, who torched BYU with 18-of-19 passing last year, struggled to replicate that effort. Senior Zayne Anderson set up BYU’s third touchdown by intercepting Hornibrook in the third quarter and returning the football 12 yards to the Wisconsin 27. A huge defensive pass interference call on the Badgers in the end zone prolonged the drive, and Canada’s 2-yard TD run put BYU up 21-14 with 9:54 remaining. The Cougars return to LaVell Edwards for a Saturday afternoon contest against McNeese State with a 2-1 record, when most thought they could be 0-3, and a boatload of confidence. The game ball from one of the biggest wins in program history? That can be found in the weight room.